Egypt reportedly sends 60 tanks, 400 armored vehicles to El Arish in biggest deployment since 1979. Residents of El Arish in northern Sinai reported Thursday that the Egyptian military has sent reinforcements of "unprecedented" size into the peninsula, according to the Egyptian Al Ahram newspaper. The forces reportedly include 60 tanks on 30 tank-transporters, 12 armored personnel carriers, 15 additional armored vehicles, more than 20 armored jeeps and 10 Military Police jeeps. 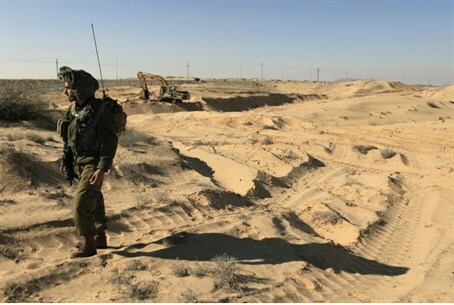 According to the peace treaty with Israel, Egypt may not send armored forces into the Sinai without Israel's approval. It is not clear if such approval was granted. Al Ahram said that the forces are en route "to the mountainous and desert areas of Sinai" – description that seems to include just about all of Sinai – and to military positions on the road between El Arish and Rafiah. There was also a report that no less than 400 'Fahd' armored vehicles were sent into the Sinai. Al Ahram online said that the military reinforcements arrived at the outskirts of El-Arish Thursday morning from the Second Field Army Command in Ismailiya. The reinforcements include "missile batteries" in addition to hundreds of soldiers, it said. It did not specify what kind of missiles it was referring to. The report said: "Since a security vacuum opened in Egypt with the fall of the security apparatus of the Mubarak regime on 28 January 2011, in the opening days of the Egyptian revolution, there has been a mutual understanding between Egypt and Israel concerning the necessity of raising the number of Egyptian soldiers in Sinai. The Egypt-Israel gas pipeline was sabotaged more than 10 times in less than a year, before the deal to sell gas to Israel was eventually abandoned. Egyptian police stations and checkpoints in Sinai have also been attacked by militants believed to be related to Jihadist Islamist groups." "In August 2011, obtaining approval from the Israeli government, Egypt deployed 2,500 troops and 250 armored personnel carriers in Sinai. Yet after the Rafah attacks on Sunday, Cairo felt the necessity to send more."